The 2017-2018 U.S. Flu Season pediatric death toll skyrocketed to 53 after 16 more children died from the flu in just the past week alone, according to the U.S. Centers for Disease Control (CDC). During a press conference on Friday, a CDC spokesperson said that the 2017-2018 U.S. Flu Season has not reached its peak, and many more weeks of the flu are still to come. Influenza A(H3) is the most common flu strain this year. The proportion of deaths attributed to pneumonia and influenza increased sharply to 9.7% for the week ending January 13, 2018, which is well above what the CDC considers the epidemic threshold of 7.2% for that time of year. The percentage of people seeing their health care provider for influenza-like illness in the week ending January 27, 2018, was the highest percentage recorded (7.1%) since the 2009 pandemic. 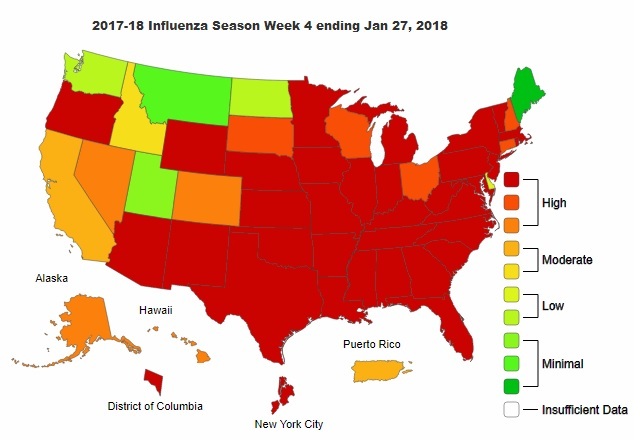 New York City, the District of Columbia, and 42 states (in red) experienced high influenza-like activity. Puerto Rico, California and Idaho experienced moderate activity. Washington, North Dakota and Delaware experienced low activity. Utah, Maine, and Montana experienced minimal activity. 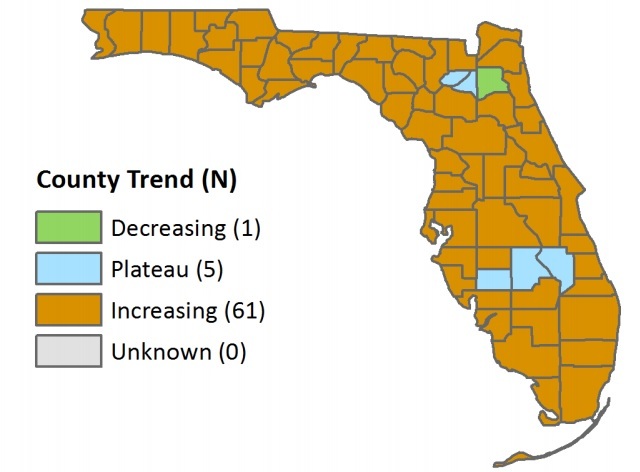 Flu activity is high and increased sharply for the third week in a row across Florida. People at high-risk for complications from influenza infection, such as adults aged 65 years and older and pregnant women continued to be heavily impacted. Most of the deaths occurred in people aged 65 years and older. So far, five children have died in Florida during this year's flu season. The Florida Department of Health says that deaths are expected to increase over the coming weeks.